“O King! Just as the shape of a temple does not affect the akasa (sky), the crookedness of the physical body has no effect on Atma (Soul). A wise man has Atma- drsti, in other words, he looks at the Reality behind this manifested world, whereas an ignorant one has carma-drsti, in other words, he gets lost in names and forms”, said the young sage, who was expert in yoga-vidya as well as established in Self-knowledge (atma-jnana). 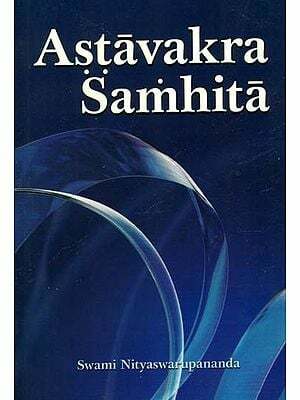 Astavakra-gita is a short treatise on Advaita Vedanta which systematically deals with the mystical experiences of the individual in his flight to the transcendental peace and Bliss. The subtle philosophical truths are expounded in the form of a lucid dialogue between the teenager Sage Astavakra and his royal disciple, the King-seer Janaka. In communicating to the seekers the unsurpassing beauty and indefinable perfections of the Absolute, the Upanisads stammer, the Brahmasutras exhaust themselves and the Bhagavad-gita hesitates with an excusable shyness. A theme, in dealing with which, even these mighty books of Hinduism are thus, at best, unsatisfactory. We must, in sheer gratitude, admire Astavakra Samhita for the brilliant success it has achieved in communicating, through words, perhaps more clearly, the nature and glory of the supreme Reality, than by Prasthana Traya. The student of this samhita is himself giving the autobio-data of the Liberated in life. We have here in this book a revealing autobiography of the saint, the Liberated in life in King Janaka. 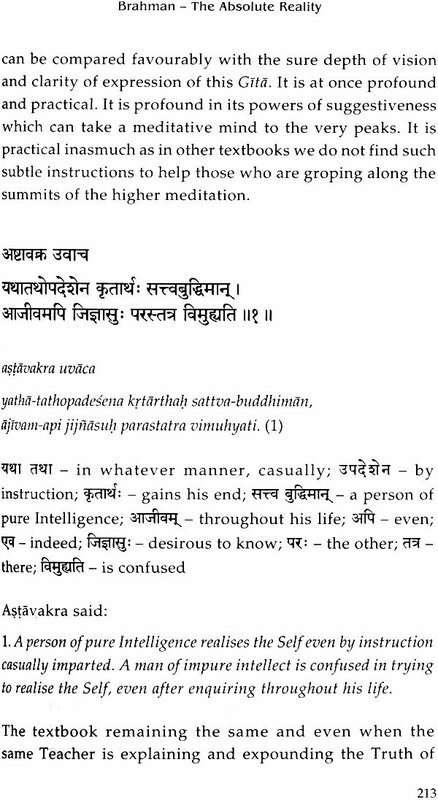 Among the world’s classical works on contemplative experiences, Astavakra-gita, which is sometimes called Astavakra Samhita, is a unique textbook. It systematically deals with the mystical experiences of an individual in his flight to the transcendental peace and Bliss. It has been said that the thoughts of this cu« are compatible with the ‘Dialogues of Plato’ and the Bhagavad-gita, as all of them truthfully record the universal insight and spiritual experiences which a seeker gathers during moments of his intense meditation. As in Bhagavad-gita, here in Astavakra-gita also, we find the subtle philosophical truths expounded in the form of a lucid dialogue between the King-seer (raja-rsi) Janaka, the disciple and Astavakra, the Teacher. 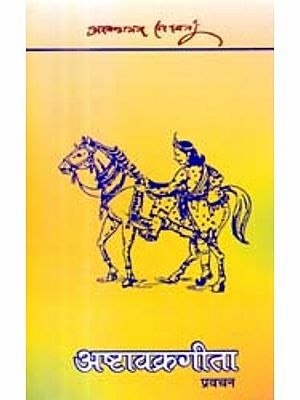 Astavakra-gita also known as Astavakra Samhita is a short treatise on Advaita Vedanta in the style followed in Upanisads meaning in the form of a dialogue between Astavakra, the Guru and his disciple, the King-seer Janaka. This fascinating legend is vividly described in the epic, Mahabharata where Maharsi Lomasa narrates it to Dharmaputra Yudhisthira, the eldest of Pandava princes. In general introduction and later in the commentary, it is repeatedly emphasised that Astavakra-gita is meant only for those advanced sadhakas who have purified their minds through sadhana and are engaged in meditation. To such committed students alone would this book show light and be a true guide. 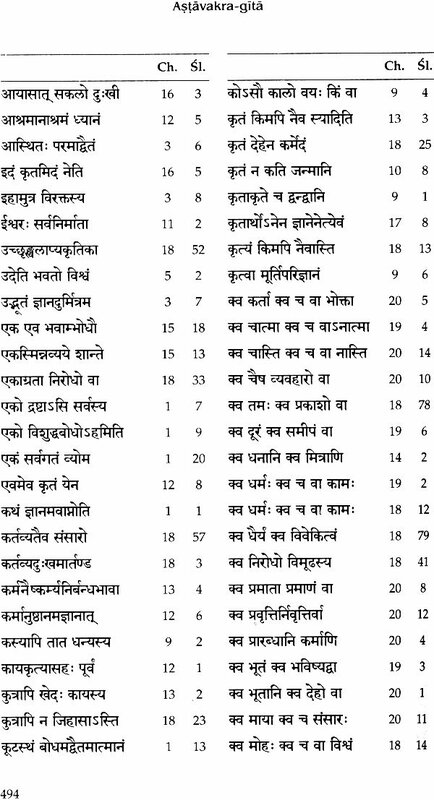 To the unprepared, immature students, the subtle thoughts contained in this Gita can be explosively dangerous and result in erasing their faith entirely from the higher Reality. Astavakra in Sanskrit means - asta meaning eight and vakra is crooked or curved - with eight crooked (limbs). How he was cursed by his father while still in his mother’s womb has been explained. In Mahabharata, the legend of Astavakra is fascinating and vivid. When Astavakra was in the womb of Sujata, his mother, his father, Kahor, a mighty student of the Vedas, used to read aloud the sacred mandalas, each day late into the nights. The unborn genius, even from the womb, learnt the texts, and one day, the child from the womb suddenly cried out, ‘Tut, Tut! Father, through your grace I have already learned all the Vedas, even while I am in my mother’s womb. But I am sorry to say that you often make mistakes in your recitation.’ Enraged by this grave insult the father cursed his son and the boy was therefore born deformed with eight curvatures in his anatomy. As a result of the curse, he developed eight deformities like hunch-backed, hump, knock-knees, bow-legs, flat-footed and was, therefore, named Astavakra. The learned Kahor, pressed by his poverty, made a pilgrimage to King Janaka’s court to beg for some royal patronage. There, he got defeated in an intellectual dual with Sri Bandi, the court-philosopher of Janaka. The victorious pandita Bandi employed the defeated Brahmana in the service of his father, Varuna. Years rolled by and the family had no news of the whereabouts of the revered Brahmana Kahor. Though a splendid student, Astavakra in the school was teased by his fellow students saying ‘you have no father’. The worried boy returned home and enquired of his mother. The boy came to know from his mother that his father had once gone to Janaka’s palace and had not ever returned from there. Astavakra, at that time, was only a mere boy of 12 years. He decided to make enquiries and started on his pilgrimage to Videha. The king was taken aback by such an incise wisdom of the young sage and requested him to grace his palace to which he acceded. Astavakra was, thus, given a place of honour in the king’s palace; he removed all doubts from Janaka’s mind. In Mahabharata there is a slightly different version. Astavakra accompanied by his maternal uncle (of his own age) Svetaketu reached Janaka’s kingdom to observe mahayajna being conducted there, as also to search his father. The king was proceeding to yajnasala and attendants accompanying him were diverting traffic to clear passage for the king. By his precise knowledge of sastras, Astavakra pointed out that a Brahmana had priority in the right of passage over even the king. On hearing, the king was impressed with the knowledge of the young mendicant and acceded the point and requested him to proceed ahead of him. Although the mahayajna was open only to established scholars, the king took him along to the mahayajna. On learning about his motive of defeating Bandi - the royal scholar - the king tested his knowledge of the sastras by questioning. With appropriate and precise answers he impressed the king who invited Bandi to engage the young sage in arguments. Astavakra defeated Bandi and thus got his father released, where he proved that though physically a boy, he had the wisdom of the ancients. There, in the court, the handicapped boy defeated the revered philosopher, Bandi and won the freedom of his father. The father let his son bathe in the river Samanga and blessed by the father the deformed child walked out of the waters cured completely, a handsome boy of brilliant charms. 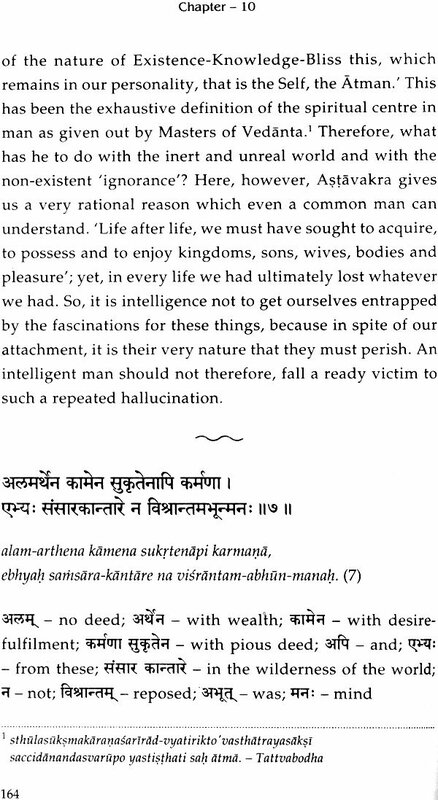 Astavakra-gita, both in its style and structure of composition closely resembles the epics. It belongs to an age prior to the systematisation of philosophical thoughts in India. Like the Bhagavad-gita it has simplicity of diction and clarity of expression, without losing the forcefulness of language and the pregnancy of its thoughts. Like the Bhagavad-gita here also we find that the Teacher refuses to indulge in any involved philosophical discussion, but the Teacher constantly directs the entire attention of the student, on to the spiritual Reality behind life and its expressions. 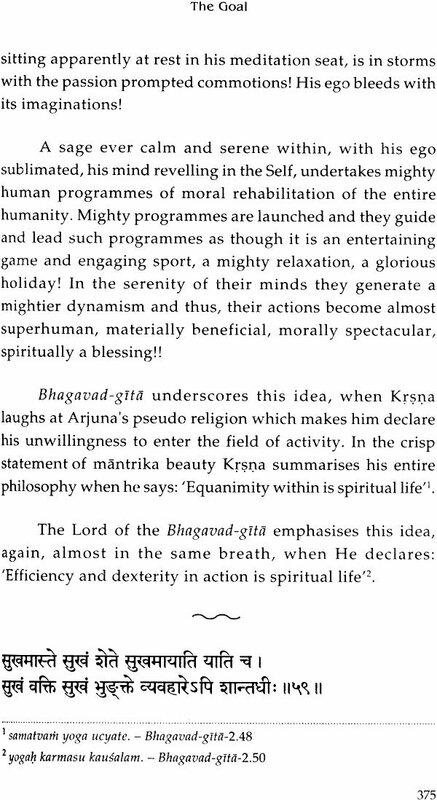 Erudite scholars after laborious study and research have assigned Astavakra-gita to a period immediately after the Bhagavad-gita and just before the rise of the great philosophical schools. 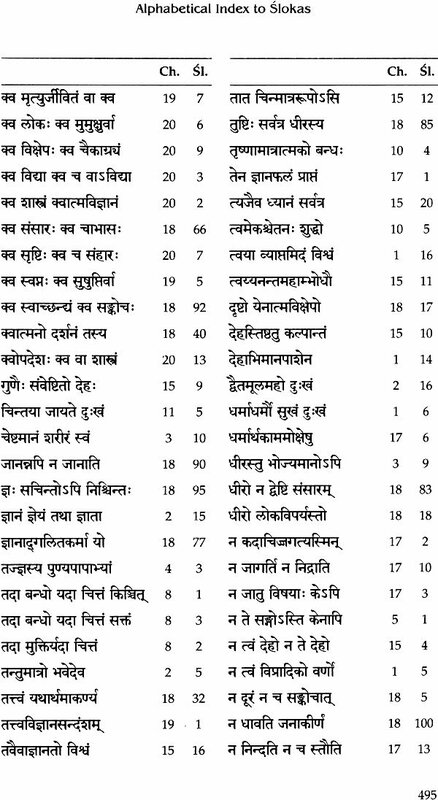 Astavakra-gita must have appeared at a time close to the later Upanisads - Svetasvatara, Mundaka, Mandukya Karika and others. There is a suspicion of a reference to the Buddhistic concept of non-existence (sunya-vada). 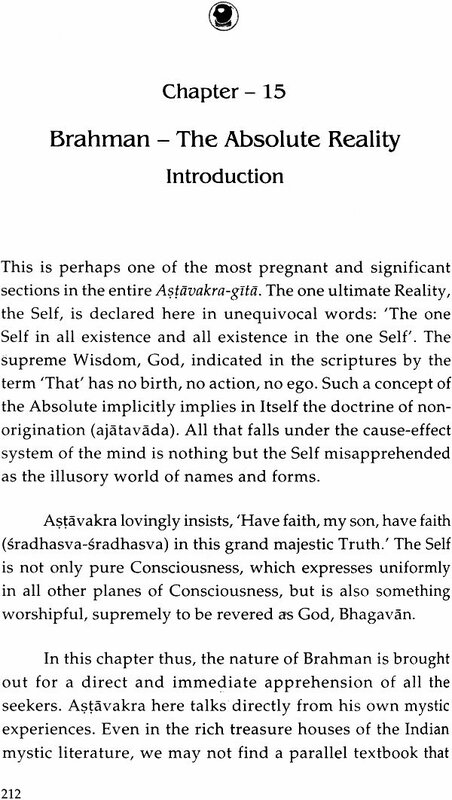 Astavakra-gita does not show any inclination to accept a personal God, as we find in the Bhagavad-gita, In this sense, thoughts of Astavakra are more faithful to the major Upanisads and their monistic idealism. To all advanced students of meditation Astavakra-gita directly points out the way and the goal. Those who have not had the early groundings in meditation and have not experienced the inner silence of meditation to them this Gita is a mute instrument. 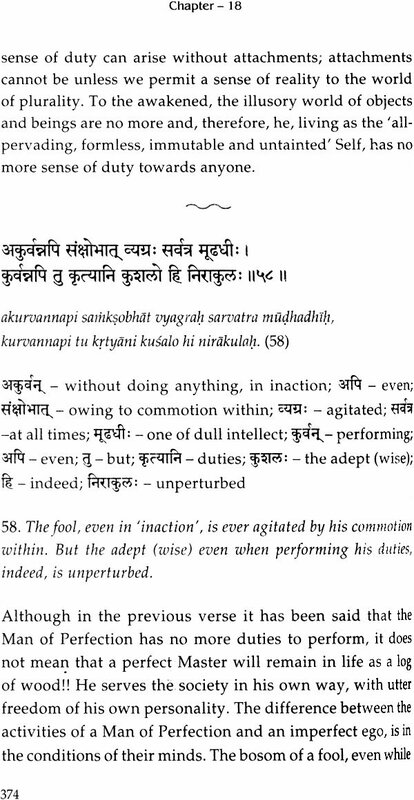 To the unprepared, the subtle thoughts of this Gita can become explosively dangerous. These can blast the student’s faith and can even shake his entire hold of the higher Reality. To those who have purified their minds and are engaged really in meditation, to such committed students alone, this textbook can show light and can serve as a true guide. As an unrelenting non-dualist, rooted in the vivid experience of the transcendental spiritual oneness, Saint Astavakra never compromises. He rejects completely the worlds of objects, emotions and thoughts perceived through the delusory body, mind and intellect. As such he refutes and totally rejects the principle of ‘maya’. 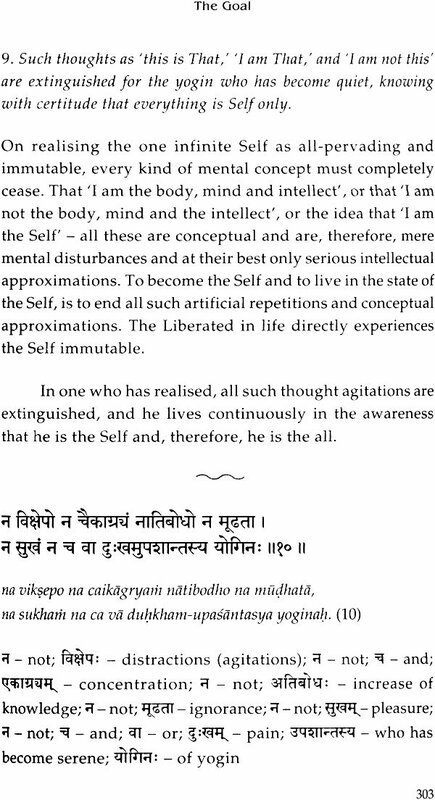 To him there is neither an individual ego (jiva), nor a Creator (Isvara), nor any delusion (maya), nor a universe (jagat) other than the one infinite Consciousness, the Self. This clearly gives us an idea of the platform of Astavakra and the types of students whom he is addressing. To Astavakra there is only one goal to be aspired for and reached and that is Self-knowledge through direct mystical intuition which he calls as vijnana. 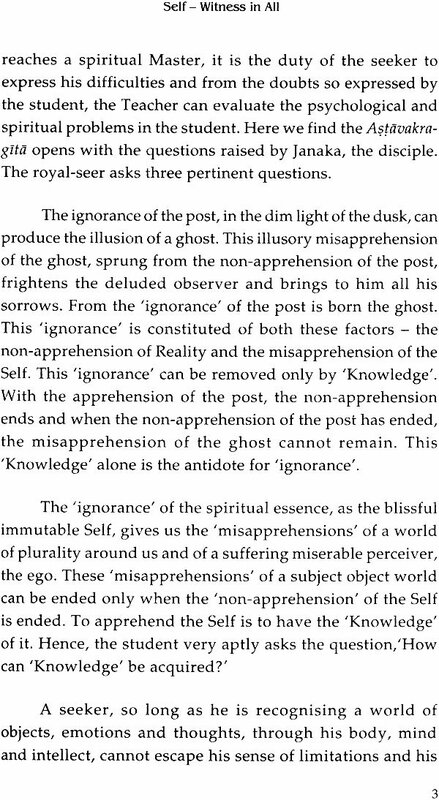 The final spiritual experience in Astavakra-gita arises to profound raptures of vision and insight and culminates in the sovereign unity of the Self that dissolves all duality, such as the knower, knowledge and knowing. In fact, the deeper essence of this Astavakra-song cannot be explained in words, but is to be experienced in the dynamic silence of one’s own deepest meditations. 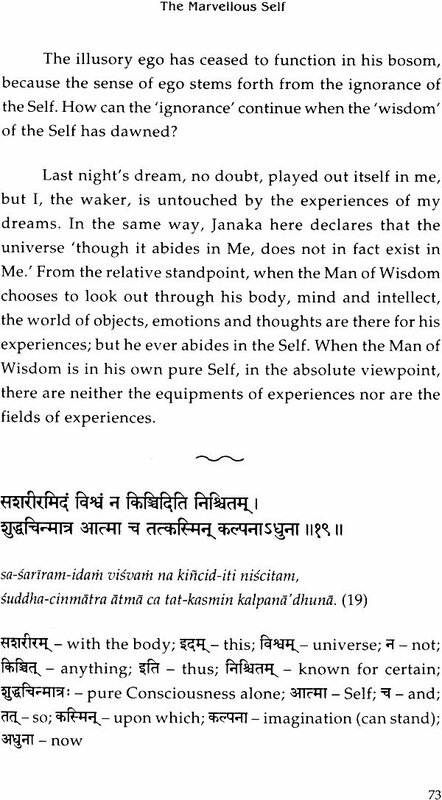 It is addressed to all the royal saints of the calibre of Janaka, to whom is attributed the oft-quoted observation in Mahabharata - ‘Infinite is indeed my wealth, of which nothing is mine. If Mithila is burnt, nothing that is mine is burnt’.